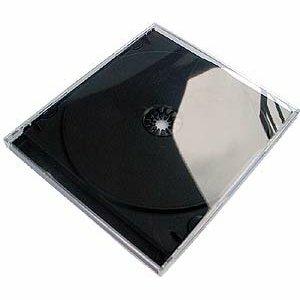 Please note this is not an Epson product. The printing revolution starts here with super cheap refillable continuous ink systems. These systems sit outside of the printer and continuously feed ink via clear plastic tubes to dummy ink cartridges, allowing for up to 100ml per tank compared with the normal 13ml or less of an Epson ink cartridge. 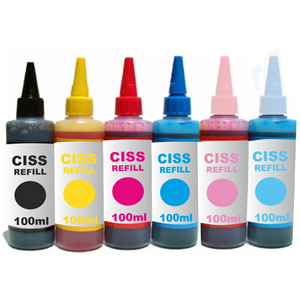 No longer do you need to keep changing ink between prints as the CISS unit can be refilled on the fly, thats even if you need to refill it! 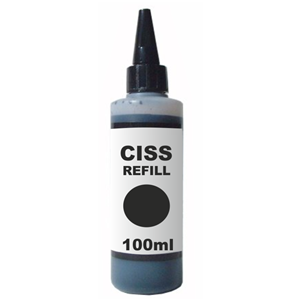 This Epson Black CISS refill bottle contains 100ml of black ink for use with any Epson continuous ink system. We check every batch of our Epson continuous ink bottles to ensure they each have the consistant great quality to match that of the ink cartridges so you need'nt worry! Our continuous inks save you up to 90% printing cost for inkjet printers! <p>For a full list of shipping destinations and weight classes <a href = http://www.3000rpm.com/acatalog/Delivery_Prices.html>click here</a>.>! !